Do you want to CUSTOM DECAL CRAFTS? Our Heat transfer vinyl (HTV) is the answer to your personalizing projects! Our heat transfer vinyl offers a one-second tack application that’s great for multiple layers.it has a pressure sensitive carrier that allows you to offer detailed designs on a wide variety of fabrics. It is a PU material that comes on a clear carrier sheet. Not like others use PVC material on the market. It’s perfect for decorating children’s clothing and accessories. Keep your kids safe, stylish, and chemical free with our materials! 1.when applied properly, Easy and Ready-to-cut material designed for custom garment decoration, The backing is pressure and temperature sensitive and easier to take off once the design has been transferred to the desired surface. Easy to Weed is a durable PU which is used to design custom t-shirts as it can be washed multiple times without ever compromising its integrity. 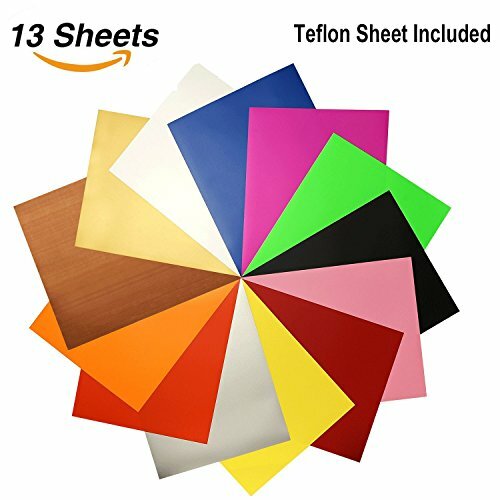 Heavy Duty Heat Transfer Vinyl with Teflon Sheet - Great Iron On HTV Vinyl.Create your own design and transfer it directly on to any cloth item of your choice such as t-shirts, bags, cushion covers, pants, jackets, etc. Works good for Cricut, Silhouette cameo, Heat press machine or any craft cutters ect. Easy Weed & Cut - Easy and Ready-to-cut material designed for custom garment decoration .The backing is pressure and temperature sensitive and easier to take off once the design has been transferred to the desired surface. Easy to Weed is a durable polyurethane which is used to design custom t-shirts as it can be washed multiple times without ever compromising its integrity. Design Your Own Garments - Each vinyl heat transfer paper is 12" x 10" in manageable size Making it very easy to handle the heat press sheets and transfer them to most items .You can use them on canvas shoes and hand bags to create your own signature style. Use a single colour or multiple colors to create your exclusive designs. HTV Vinyl Bundle In Great Assorted Color - The selection of colors is great with 12 most popular EasyWeed colors, including White-01, Black-02, Royal Blue-03, Orange-08, Yellow-06, Silver-13, Sun Yellow-28, Flor. Pink-19, Flor. Green-18, Light Pink-65, Red-05, Gold-12 and the weight of the film is perfect. If you have any questions about this product by Beauty-US, contact us by completing and submitting the form below. If you are looking for a specif part number, please include it with your message.